Is Oregon A Community Property State? The division of property in a divorce has a substantial impact on your financial situation moving forward. Regulations vary a great deal from one state to the next, so where you live also influences this step. Our West Coast neighbors, Washington and California, both use the community property model. As a result, the question often arises: is Oregon a community property state? 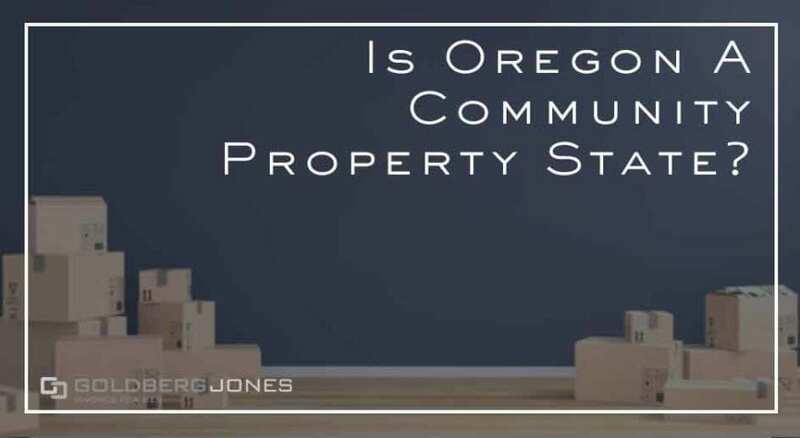 The short, quick answer is no, Oregon is NOT a community property state. Though the regions to the north and south of us both take this approach, they’re actually in the minority. Only nine of the fifty states—and Alaska by agreement—in the union adhere to community property statutes. The rest practice equitable distribution and Oregon falls into this category. Community property states view all property and debts acquired during a marriage as belonging equally to both spouses. The law presumes joint ownership, no matter who acquired a particular asset. In the case of divorce, the court divides property as such. As opposed to community property states, equitable distribution views property as belonging to the individual spouse who earned it. When it comes to divorce, no set rules for division of property exist, but the court divides the assets between both parties in a fair and equitable manner. The two sides sit down, usually with attorneys, judges, or mediators, to determine the ideal way to split up the marital property. In both equitable distribution and community property states, the general idea is for each spouse to emerge on relatively equal footing. Additionally, the goal is for both to maintain a standard of living similar to what they enjoyed during the marriage. Before getting down to the business of dividing your property, it’s important to know that there are two kinds of property: separate property and marital property. Oregon treats both of these types of assets differently. As the name implies, separate property belongs to one spouse or the other. Though it’s usually something owned before marriage, this category also includes gifts or inheritance received during a marriage. The court can include separate property if fairness dictates, but in general, it remains with the owner. In longer marriages, things become much more intertwined and the line between separate and marital property tends to blur. All property acquired or earned during a marriage generally constitutes marital property. Despite a name on a title, Oregon courts presume both spouses contributed to any assets acquired during the marriage, whether true or not. Property equally acquired is subsequently equally distributed in divorce, in a fair, equitable fashion. It is possible for spouses to work out how to divide property on their own. If both sides come to an agreement, the court will generally accept it, unless it skews drastically in favor of one party. Even once the courts get involved, you can make a case for ownership. You can argue that the other spouse didn’t contribute as much to a certain acquisition. Or the two sides can bargain and haggle. For instance, perhaps you’re willing to cede possession of a car in exchange for the title to a boat. Divorce also treats debt like any other piece of property. If it was accrued during the marriage, it is viewed as marital property. Financial obligations are split up based ability to pay and who is most responsible for acquiring them. If it was preexisting, however, it remains the responsibility of the spouse who picked it up in the first place. Equitable distribution doesn’t mean the court divides all assets in half. A number of elements go into the court’s ultimate decision on the matter. The amount of property factors into the equation. If significant items, like a house or other property, need to be sold, the court considers costs and expenses associated with that. This includes thing s like taxes & fees. Even if only one spouse works, the court accounts for other party’s role and contributions as a homemaker. Anticipated costs also figure into the division of property. If you have children, the court accounts for their ongoing needs. This includes the ability to pay child support and provide for their care and well-being. For example, the custodial parent may get the marital home for stability and continuity’s sake. Division of property varies wildly from case to case. How the court splits shared assets depends on a wide array of influencing factors. And individual judges have their own interpretations and applications of the laws and regulations. Knowing that Oregon is an equitable distribution state, not a community property state, is a good starting point for understanding the process. What about a pet dog who was acquired during the marriage? Hi Gordy, thanks for reaching out. Pet custody and other legal issues around pets and animals is a constantly evolving thing. A lot depends on the specifics of your situation. I passed your contact information on to Colin Amos, our managing attorney. He’ll be in touch soon and once he knows the particulars he’ll be able to give you a better idea of your options. Do married couple share possessions in Oregon and Portland? Hi Eva, thanks for the question. Possessions from before the marriage, or some things like inheritances, are often considered as belonging to one spouse or the other. But in general, if it was acquired during a marriage, it is usually viewed as belonging to both spouses. However, it really does depend on the specific situation. I passed your contact information on to Colin Amos, our managing attorney. He’ll reach out soon and be able to give you a better assessment of your particular circumstances. Best!